I am a generous participant and curious observer in the game of life. I am fearless, and gentle. I am brave and serious. There is a wild side of me that is worth getting to know, and if you have a moment, I'd like the pleasure of your company. It is my personal experience that there is an art to being grateful, and so many things to be thankful for. Spending time talking about it makes me happy and hopeful. I have been told it has the same effect on others. I hope that is your experience also. I am embarking on some new challenges and adventures. I believe that what I encounter along the way my benefit others. I hope you will join me as I continue this journey and see where the path leads. Sign up for e-classes, newsletters and other information that will be delivered in your inbox. One of my promises is that our conversations will enrich your thought-life even if you never write a word. I will use your time wisely and not use your info in any undesirable way. "The Power of the Positive Pen~Your Writes to Pursuing Your Passion and Purpose"
I have been journaling for years. 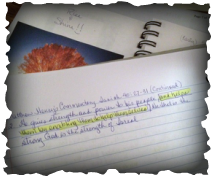 In May 2011, my journaling turned into a more deliberate meditation. Since then, I have met some incredible people who have made major changes in their lives through their health, their relationships, and the world through their own peace. As a self-proclaimed wordsmith, I believe we all possess this power, and yes, have that much influence. My experience with adoption and recovery are the authority I speak from and stand upon. From the printed Word in the many translations of the Bible to the headlines in all of the various printed media available to us, all of the words become our collection of remembrances. I feel called to leave my mark in this way. I feel that I am the 'collector'. The Creator who made all things first for us, gave us also the ability to do something with these things. Each thought captured is a celebration by including it in my journals. The random-ness of the flow of thoughts begins to have a sense of order when I capture, collect and then delight or learn from what it reveals. In the last 3 years I have experienced a personal growth that has opened doors, achieved goals, and illuminated joy within that only asked to be released. Words have that power. Just so you know, there are affiliate links throughout my website, and I earn a commission on purchases made through them.